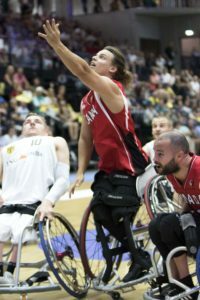 (Hamburg, Germany) The Canadian Women’s Wheelchair Basketball Team improved to 2-1 at the 2018 World Championships with a wild 82-74 overtime victory against Australia on Sunday in Hamburg, while the Canadian Men secured their second straight win by outduelling a feisty German team 78-61 in front of a boisterous hometown crowd. It was truly a battle of attrition with Canada scoring first and often but Australia refused to go down without a fight. With Australia in foul trouble, Canada seized the win with precision shooting from the free throw line down the stretch in the extra frame after a nail-biting finish to regulation time. “My foul shooting was rough in the beginning of the game, so watching those ones [at the end of the game] go in, there was a moment where I felt like I was breathing fresh air. It felt really good. I am really glad that I was able to make the gap bigger so we wouldn’t have to have so much stress. I’m just really happy right now,” said Canada’s Arinn Young (Legal, Alta.). After trailing for the entire game, Australia looked to have completed a comeback by taking its first lead with one-minute left in the fourth quarter. With the Aussies up by three, Young hit a massive three-pointer to tie the game with 20 seconds left. “That will be one of the all-time favourite basketball games I will ever play in. I’ve never felt so confident in my teammates. And I just think that was such a good family win. All of us fully took part in that game and came together to pull it off,” added Young. Australia hit a free throw to go up by one with six seconds remaining, but then fouled Canada’s Melanie Hawtin (Oakville, Ont.) on a shot attempt as the final buzzer sounded. With the game on the line, Hawtin delivered a clutch free throw to tie the game at 68 and force overtime. “We had really good focus in the beginning and I think we lost it a little bit when they went on that run at the end, but we refocused and went into overtime with Melanie’s clutch shot,” said Tamara Steeves (Mississauga, Ont.). “The coaches did a good job of helping us keep our calm. The whole bench never got too stressful, never too high or too low. So ,when Mel made that free-throw we were ready and knew that we could go on and do what we needed in the extra time,” added Cindy Ouellet (Quebec, Que). Young led all players with 31 points and 15 rebounds for the double-double. Ouellet tallied 21 points, while Rosalie Lalonde (Saint-Clet, Que.) and Steeves had 14 and 13 points, respectively. 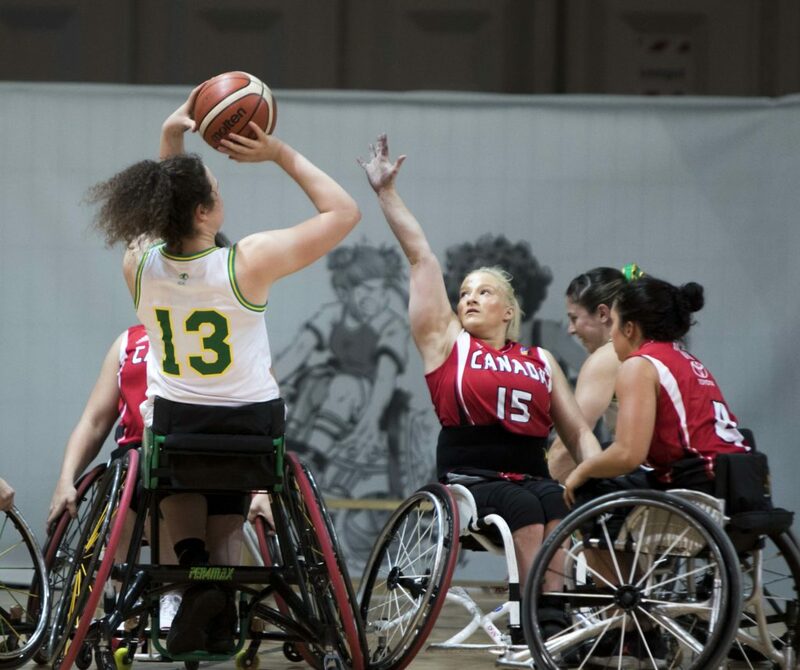 It was Canada’s secondary scoring that proved to be the difference in their 78-61 win over Germany. They were led by Nikola Goncin (Regina, Sask.) who scored a game-high 26 points after coming into the game late in the first quarter. It was a bit of a homecoming of sorts for Goncin who spent the 2016 season with the BG Baskets in Hamburg and was accustomed to competing in front of the raucous fans who packed the building. With Canada trailing 25-22 with three minutes left in the first half, Goncin sparked the Canadian offense by first dishing the ball to Patrick Anderson (Fergus, Ont.) for an easy lay-up. Then the dynamic duo combined for three consecutive three pointers as part of an eleven point run that allowed Canada to regain the lead heading into the break which they never relinquished. Anderson accomplished the rare feat of earning a triple-double. He finished with 24 points, 15 rebounds and 10 assists, while Goncin also added six assists to his tally. The Canadian men face Iran at 5:45 a.m. ET on Monday in their next game. The Canadian women are off on Monday and return to action against the Netherlands at 12:30 p.m. ET on Tuesday, August 21.